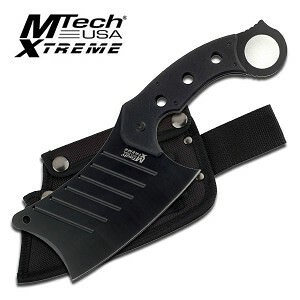 The pirate style cutlass with a solid design and intricate detail. 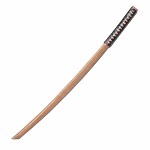 The sword is almost perfectly balanced with a solid steel guard and full knuckle style guard. The fittings of the sword are very impressive with a detailed skull and cross bones on the scabbard throat. Overall Length: 30"
The blade of the sword is 440 stainless steel with a mirror polished finish, short ricasso and false edge. The sword comes already sharpened with an extremly sharp point. 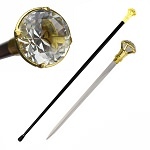 The scabbard of the sword is wooden with a dull black gloss finish and shiny highlights. The drag of the sword is brass with a ball point tip and two crossed pistols in relief. 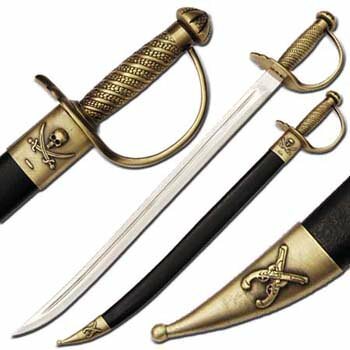 The scabbard throat is also brass with a skull and crossed swords. 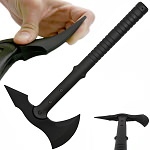 The guard is a solid design with a one piece construction knuckle bow and cross guard. 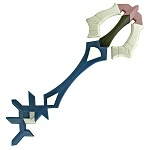 The knuckle bow has been ridged for better deflection and butting capabilities. The handle is solid steel with a spiral design. The pommel of the sword is an ornate capstan rivet.